See Video of The Orange Shop Story! About 6 Minutes - click below. That's the year The Orange Shop opened for business. 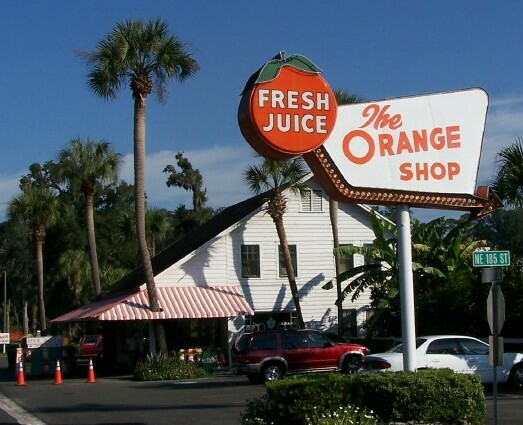 Before World War II, people started traveling down to Florida on U.S. Highway 301, passing through the small village of Citra - long famous for the citrus that grew there. 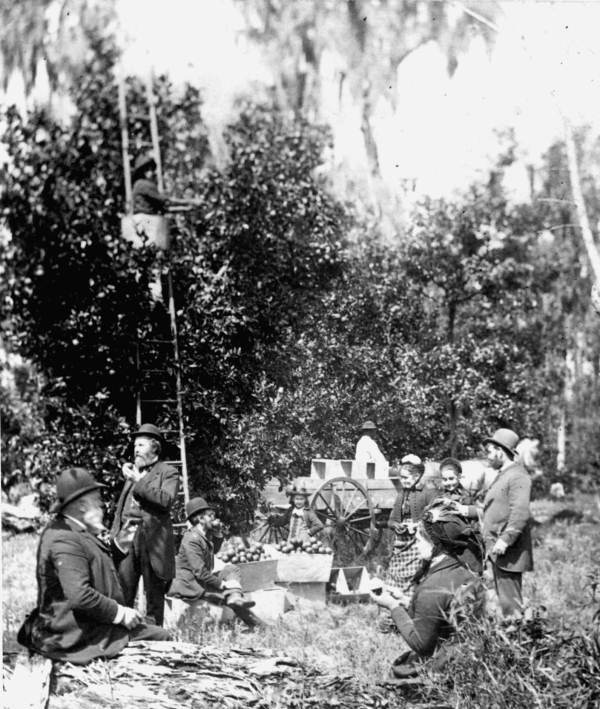 Citrus had been grown commercially in our grove in Citra since the Civil War, so it just seemed natural to offer it to travelers so they could take a little "Florida Sunshine" to remind them of their trip. The Shop has been open for business every fruit season since then. Our formula for success is unchanged -- we cultivate our citrus trees with tender loving care, hand harvest the fruit, pack them in bags or gift boxes for our customers, and provide friendly, helpful service. Technology has allowed us to broaden our relationship with customers, but the core mission of The Orange Shop hasn't changed at all for 70 years. What's Our Secret? Just Plain Old Hard Work, with a History! Pete and Cindy Spyke, owners of The Shop, are third-generation citrus growers with a passion for growing really good citrus using environmentally responsible growing systems. We have a strong legacy in the business -- H.L Spyke and Son Fruit Company actually began down in Fort Lauderdale and Davie, Florida in the 1930's. 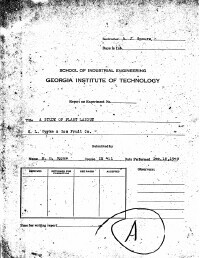 Pete's Mom, always trying to unload clutter, recently gave us a copy of a paper written by Pete's Dad, Harry H. Spyke, in 1949 for a project when he was studying Industrial Engineering at Georgia Tech. It was a design of the plant layout of the family's gift fruit shipping business for an expansion planned by his Dad, Harry L. Spyke, and it must have been pretty good because he got an "A". It was very interesting, because we still use almost the exact same machinery setup at The Orange Shop today! In fact, when reading the paper, we realized that he had some pretty good ideas that we could use to improve the flow of fruit through the packinghouse. Even though Harry hasn't been with us for almost 30 years, and the paper was written 65 years ago, we realized that Dad's still coaching us on how to get better -- our perennial goal. We think that's really great, and will always feel like we have big shoes to fill. Every day we try to live up to the traditions of The Orange Shop, and our family. You can see an excerpt of Dad's definitive work on the design of a gift fruit shipping business here. Our Fruit is The Best of the Best. The Shop's fruit comes from the two best fresh fruit growing areas in Florida -- beautiful Marion County, and the Indian River area. Florida citrus always has more juice and sugar due to the warm summer nights. There are microclimates, however, where the usual Florida quality reaches even higher levels. That's where Pete and Cindy have selected land for growing Orange Shop fruit. Citra Navels: Navel Oranges grow and produce the best when the winter temperatures are cool, without dropping so low that the trees are damaged. Our groves in Marion County are located at the farthest northern point of the citrus growing area of Florida. Besides wonderful soil, this area has cooler weather in the Fall that is perfect for the production of the highest quality Navel Oranges in the world. Indian River Grapefruit and Specialty Varieties: We grow our grapefruit in the oldest production area of Florida's Indian River, where warm ocean breezes help sweeten the fruit -- perfect for the production of high-quality grapefruit that is again the best in the world. Our groves near Ft. Pierce were first planted in the early 1900's on the rich soil along Ten Mile Creek. We have been working these groves for three generations, and we utilize the latest information and technology along with traditional practices to achieve the highest possible quality. It's also where we grow our delicious specialty and Spring Connoiseur varieties such as Honeybells, Temples and Tangerines. We Are Committed To Excellence. The Orange Shop is a very real small operation - unlike the mega-shippers and storefronts on the Web. The entire Town of Citra supports the business, and many have been working at The Shop for decades. They all watche over things every day to make sure that the fruit you receive is the best. They are completely devoted to the goal of providing you with the very best fruit, gifts, and service. It's truly a privilege and honor for us to work with them every day. When you order from The Shop, or stop by on US Highway 301, you can be assured that you've made a good choice. We take pride in our history, the quality of our fruit, and the friendly service that is our hallmark.